Anticipate the most likely disputes. Resolve key issues in your favor. Protects you by complying with your states requirements. 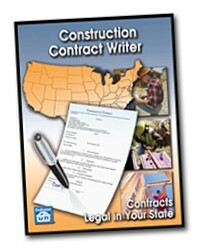 Construction Contract Writer has you covered. You don't need any legal experience -- just answer the program's interview questions. And if you get stuck, click the ""Get Help From an Attorney"" button. You'll have an answer in 24 hours. No charge. No limit. Construction Contract Writer is an interview. Just answer the questions to draft contracts as detailed or as simple as the project requires -- anything from a small home improvement job to a major commercial project. No legal background needed. Explains everything you need to know. Exports to MS Word or Adobe PDF for delivery as an email attachment. 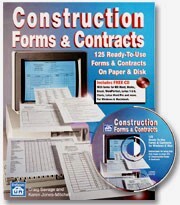 This box set contains a Construction Contract Writer disk that installs in a few minutes on Windows XP or higher. Then connect to the Web to select the state where you build and collect the most recent update. The first year of updates is free and automatic. After that, updates are $25 a year (or $40 for two years). You'll be notified when changes in the law affect your contracts.